Perched dramatically over the bay the Hotel combines elegant European architecture sweeping coastal views and sophisticated style to create the perfect vantage point from which to enjoy the gentle sounds of the surf the fresh scent of sea air and the sight of otters seals and dolphins at play. 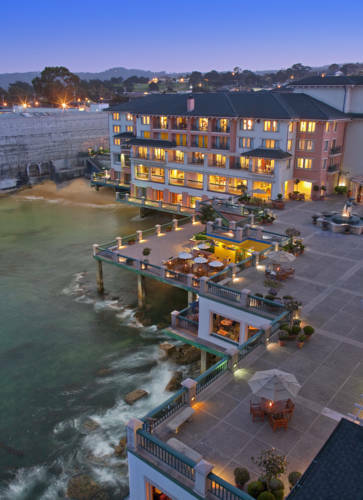 The Monterey Plaza Hotel is a proud to have been named by the reviewers of TripAdvisor one of the Top 25 Hotels in the entire United States and is a recipient of the 2013 Forbes 4 Star Award. Piano Lounge: The Piano Lounge in the lobby of the Monterey Plaza Hotel and Spa offers live entertainment every Friday and Saturday night. Cafe La Strada: Our piazza-style oceanside coffeehouse is the place to start your morning with the rich flavor of freshly roasted Peets Coffee and artisan pastries. Enjoy specialty sandwiches soups amazing desserts and more all made daily. Schooners Coastal Kitchen and Bar: Schooners Coastal Kitchen and Bar suspended over the waters of Monterey Bay is a stunning restaurant featuring approachable contemporary American cuisine.